CinemaCon, Las Vegas, Nevada (April 24, 2018) – HARMAN Professional Solutions, the global leader in audio, video, lighting and control systems, including networked AV, today announced that JBL C221 and C222 two-way ScreenArray cinema loudspeakers are now shipping in limited quantities, with full availability in May 2018. JBL C221 and C222 loudspeakers help small- and mid-sized cinemas upgrade to next-generation JBL technologies for improved coverage and smooth sound reproduction at an accessible price point. 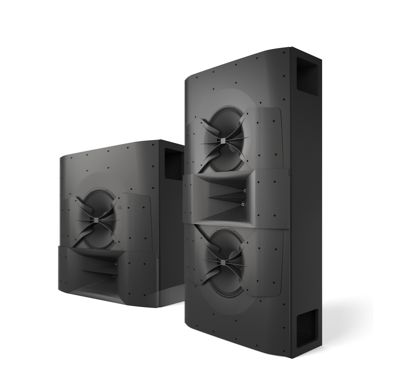 Featuring patent-pending Dual Dissimilar Arraying and Acoustic Aperture Technology, C221 and C222 loudspeakers continue the JBL legacy of leadership and innovation in cinema audio, combining a compact design with the latest technology for superior performance and better coverage for raked seating. The JBL 200 Series was designed to offer cinemas an affordable solution for creating the best possible audio experience in small- to mid-sized rooms. By including new, patent-pending technologies that complement the legendary sound of JBL cinema loudspeakers, the 200 Series offers a solution without compromise—improving performance and coverage while dramatically lowering the total cost of ownership. The JBL 200 Series also includes Acoustic Aperture Technology that works seamlessly with its low-distortion 15” driver. The integrated Acoustic Apertures create a horn-loading effect, helping to maintain a wide horizontal coverage pattern through the crossover range while improving speech clarity. The result is even coverage of the entire cinema seating area, making every seat the best seat in the house. Advanced passive crossovers and DSP in the amplifier, requires only one amplifier channel per speaker for most of the line. JBL C221 and C222 two-way ScreenArray cinema loudspeakers are now shipping in limited quantities, with full availability in May 2018. Learn more about the JBL 200 Series line of Two-Way ScreenArray Cinema Loudspeakers at jblpro.com/cinema.